BeautyFruityBlurbs: FEEHA JAMSHED COUTURE. GET THE LOOK? FEEHA JAMSHED COUTURE. GET THE LOOK? Four years back H&M contacted Feeha Jamshed with an offer to buy her designs - she refused. However, H&M was determined and they are back with a 'Feeha Jamshed Couture' inspired (or shall we say blatantly copied) dress. The dress is from the 'Minaal's Rose to Gold Dust' Collection. 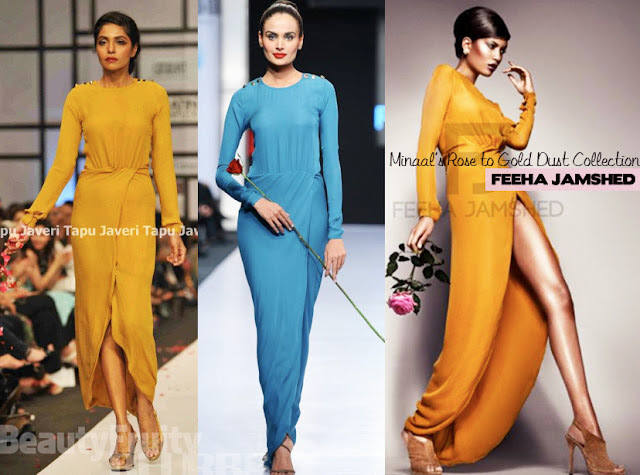 High Street brands are known for duplicating runway trends (for way cheaper) before they hit the boutiques; that is their speciality, and though Feeha Jamshed is very well known and has gained recognition worldwide, there are still many that might not know this dress is a copy. I do believe imitation is a form of flattery, it might be an annoying form of flattery but it is one nonetheless. It's amazing that they have their eyes plastered so closely on her work - but no surprise either because Feeha's pieces are truly spectacular. For those of you who would like to get the look for cheaper, this is your opportunity. For the ones that want the couture dress - there are many balls and parties coming up for you to dazzle in this exquisite number. Click here to place an order. The H&M inspired dress is identical, minus the length and shoulder studs. Click here to view. H&M should really collab with a Pakistani designer now. Feeha Jamshed x H&M. Thoughts?